And now what ? What will happen on and after October 2, after the referendum organised by the autonomous Catalan government and its failed repression by the central Madrid government ? For weeks analysts, observers and media throughout Spain and Catalonia have been asking – with growing anxiety – that question while the battle between the two camps was going into crescendo. Without being able to stop this dangerous spiral. Now the dice have been cast. The Catalan government has succeeded in organising its own referendum and in carrying 90% of the 42% (figures given by Barcelona) who wished to, and managed to cast their votes. Yet Prime Minister Mariano Rajoy’s decision to respond by sending as many police forces and judges as possible, blocking the regional budget, censoring the Internet, arresting officials to crush this – constitutionally illegal but politically understandable – initiative has made the legal elections requirements impossible to fulfil only to leave the results open to discussion. Rajoy has shown himself unable to foresee the crisis which has been brewing ever since the Constitutional Tribunal invalidated in 2010 the new autonomy statute (Estatut) voted by the Spanish Parliament, and validated by the Catalans in a referendum giving them the right to be called a nation within Spain. Unless he deliberately wanted to play a strategy of tension to consolidate his shaky power – he lacks a majority in the Cortes – tainted by the massive corruption of his Popular Party. Moreover, his heavy-handed strategy of opposing the referendum by force has failed, as 2.2 million Catalans out of 7 managed to cast their ballot. This was not only a political and moral failure, but also a media and diplomatic own goal, as the reports on police violence against peaceful crowds – causing hundreds of casualties – flocked onto the web or were watched with awe by millions of people throughout the world who, till then hardly bothered about Catalonia (considered by most a paradisal holiday resort), and who had no particular fondness for another European separatist movement. This has compelled European governments which had been supporting Madrid’s right to deal with its internal affairs, to cast a worried eye at yet another unneeded crisis in the midst of the Brexit negotiations. On this October 2 it is worthwhile reading the main, moderate, Madrid and Barcelona dailies, both strongly opposed to independence. Both put squarely the blame on both sides, albeit more on the Catalan head of “Govern” (Government), Carles Puigdemont. But it is Mr. Rajoy they accuse the most. “even the (Catalans) flagrante delicto could not justify Rajoy’s passivity and incompetence, his political aphasia(…) or his cowardly delegation of responsibilities to the judiciary”. “If he has not been able to foresee what was going to happen it must be because he didn’t read Catalan or Madrid papers or watch on television the thousands of articles and declarations by politicians, intellectuals or businessmen(…) on the need to take the initiative to solve Spain’s territorial problems”. Barcelona’s La Vanguardia recognised the “popular mobilisation” as well as the “true fury” from some members of the Spanish police; but also the “deep fracture of Catalan society who, in its majority, reject yesterday’s events”. So both sides should quickly do away with “empty words”, stop the spiralling tension and its overexploitation and set up an independent commission to look for a way out for both governments. “The referendum is illegal but it does not mean we should despise the mobilisation of so many people looking in good faith for a better future for Catalonia. It should on the contrary push for negotiation with the Spanish government. The international community would be mystified that this was not the logical outcome”. One can be against independence and for a reasonable settlement. Could this work out? Is it still possible now that tensions are so high, and politicians so entrenched in their positions? Independentists are divided between the old bourgeois, traditional centre which long ruled Catalonia, Republican historical nationalists and the leftist extremist CUP whom neither like but need to have for a majority in Parliament. Some want a negotiated independence, maintaining strong links with the rest of Spain while others, like the CUP, demand immediate cutting of all links. As for voters, previous opinion polls have shown pro-independence voters representing just under 50%. Till the abolition of the Estatut by the courts in 2010 they were only 300,000. These same polls also show between 70 and 80% of them dissatisfied with the current situation and likely to vote for more devolved powers, starting with the fiscal autonomy the Basques already enjoy. On the Spanish side, the situation is no better as Catalonia has become a political football. The aim of Rajoy’s intransigence has been to unify his party behind him and divide the opposition – mainly the Socialist PSOE, a part of which shares his intransigence. Its leader Pedro Sánchez is opposed to repression and pushes for a “political solution”, a new, federal Spain, and has taken its distance from Rajoy’s call for unity among all Spanish parties on Catalonia, which might well fall on deaf ears. The new leftist party Podemos has been advocating for a referendum while asking voters to vote “no”; its Catalan branch, Podem, is divided, some have voted “yes”, others abstained. No one wants to share with the PP the blame for the Catalan failure and they could use Rajoy’s failure – as well as the corruption enquiry in which he is involved – to get rid of him. 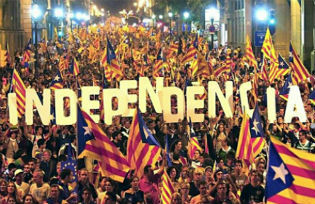 In fact, the independence question has become as much a problem for Spanish as for Catalan politicians. In contrast to Scotland, which was granted an independence referendum by London – and lost it – Rajoy never conceded Catalans the same right, although they would certainly have won it handsomely had he made some convincing concessions to the masses who had voted for the 2006 Estatut. But Spain is not Britain (see my previous piece for openDemocracy on Catalonia and Scotland). It is a country in which the Castilian majority see themselves as one and indivisible and not based on different nations speaking different languages, with their different histories and particularities like Catalonia but also the Basque Country, Galicia, Valencia, the Balearic Islands, who don’t want independence but more autonomy. This vision is anathema to many Spaniards and often instrumentalised by Spanish politicians, from left to right, who don’t want to be seen to be the ones who “lost” Catalonia. Starting with the hard-liners who are already asking Mr. Rajoy to repeal Catalonia’s autonomous status and use more force. Catalonia has sometimes been portrayed as egoistic, wanting a greater share of the country’s wealth at the expense of other regions, by some Spaniards as by people from other countries who don’t always understand its peculiarities. Yet it has accommodated a huge number of outsiders, mostly from Southern Spain, but also Latin America, Eastern Europe, North Africa and even China, who have been taught at school in Catalan and are well integrated. It is not for us to judge who is right and who is not. There are extremists on both sides and electoral propaganda is never the best way to arrive at truth. Between 60 and 70% of Catalans have at least one grandparent born elsewhere. Catalonia is probably the only place in Europe where people have taken to the streets to get the right to welcome more refugees. This is not exactly the kind of petty chauvinism to be expected from a region wishing to portray itself as ‘A country’. Anyway, it does not seem possible to predict how things might develop only a few hours after the unfolding of such a crisis, which has taken on an international dimension thanks to the mass media coverage Catalan independentists have been wooing for years while they were shunned in recent months by the Madrid government. A lot of goodwill, patience, common sense, compromise and respect for each other will be necessary from both sides. No false hope that things could be swept under the carpet and quieten down: this is no longer possible. No counter-productive hard ball. Negotiations must be started at once, if need be with outside mediation. Delaying the process for futile political gain only gives time to the firebrands to hijack the agenda and push it towards a conflict which could be deadly. And, after years of deafness and silence, the Madrid side should at last accept a real, concrete, no name-calling (“fascists”, “Stalinists”…) precondition-free, dialogue on a new status. Meanwhile, pro-independence Catalans should avoid making irreversible decisions which could only divide their own people, such as proclaiming total and immediate independence. After all, their movement has so far been peaceful, as we saw last Sunday when they raised their hands in front of armed police to show they were not in it for a fight. The time has now come for Europe to make its voice heard after Madrid’s brutal repression, as well as its failure to listen to that many of its own people, has created a human rights crisis which cannot but have consequences outside its borders.